Long hair on a man’s head is usually scoffed at and scorned. Long hair on a lady’s head is admired and appreciated. 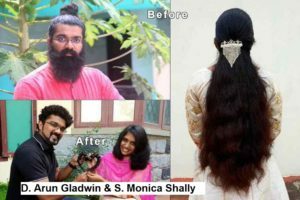 Who is losing hair to chemotherapy. May be an eye sore to the public. Not everyone is a fashion monger or a freak. A noble cause may hide behind what others see. Shall we join hands, spread awareness and conquer cancer before it conquers us?